In a rapid counter attack, Manan Mendiratta prepares to slap the puck across the ice into the netting. 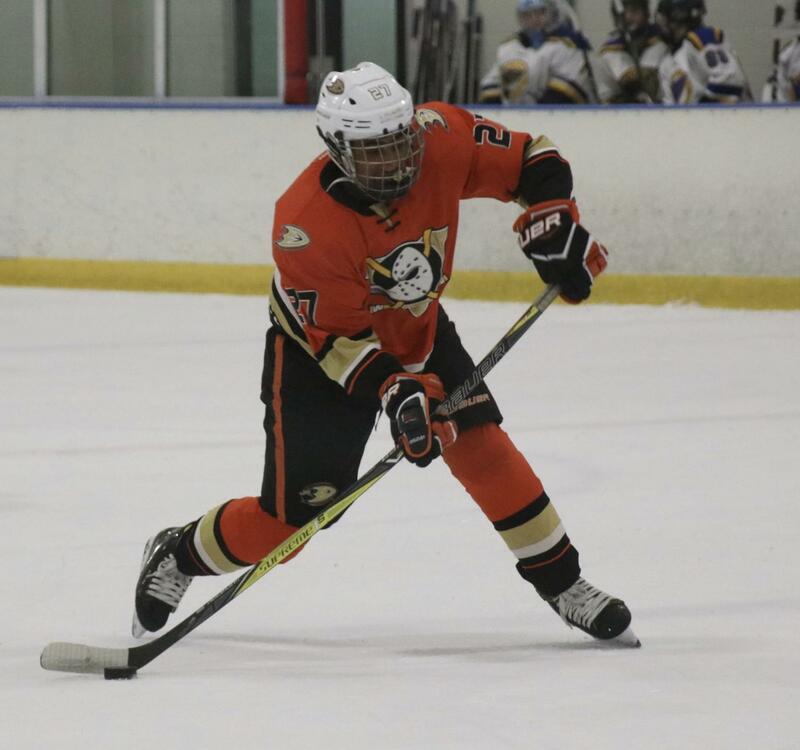 His travel team, the Anaheim Junior Ducks, is one of the top three in California. Junior Kiyan Dhanidina holds up the first place Southern California Ice Hockey Finals trophy that his team, formed in June, that won after a close game (6-5). Dhanidina is not playing this year due to SAT testing and a rigorous course load but said he is looking forward to re-joining next year. Donned in heavy uniforms and a pair of shiny silver skates, junior Kiyan Dhanidina and sophomore defender Manan Mendiratta skillfully maneuver across the ice court, guiding the small black puck in the pockets of their hockey sticks to the netted goal. Ice hockey uniquely combines the grace of ice skating with the excitement and camaraderie of a team sport. Dhanidina formed a deep connection with the sport by attending games at local rinks with his mom, ultimately cultivating an eight-year dedication to the game. Similarly, Mendiratta, a five-year player, formed an instant connection with the sport after watching his first professional game. For student athletes like Dhanidina and Mendiratta, ice hockey carries an intensive schedule that can cause difficulties between the balance of time consuming extracurriculars and rigorous school classes. Despite the grueling effort required, ice hockey, like many other sports, teaches important life lessons like patience, team spirit and dedication. Ice hockey can also have its drawbacks. The cost of ice hockey ranges around $4,000 for club, without traveling fees and gear costs included. In addition, students in Orange County are unable to play with their classmates with no team on campus. However, these drawbacks also serve to make the sport more enjoyable for its players.